May Ruark's prosecution make prosecutors more sensitive about collateral consequences | Jon Katz, P.C. 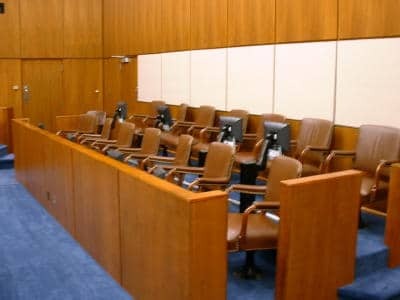 Photo from website of U.S. District Court (W.D. Mi.). Wicomico County, Maryland, chief prosecutor Davis Ruark risks losing his eighteen-year post if convicted for his February 22 arrest for drunk driving and possessing a handgun while under the influence of alcohol. Mr. Ruark hopes he will be forgiven for this incident. Last Saturday he admitted to drinking alcohol in Salisbury — where Perdue chicken is headquartered — after working late that Friday night, and then driving to Ocean City in a government-owned vehicle. Ironically, his car had been government-seized through forfeiture from its previous owner after an arrest, with governments nationwide, unfortunately, reaping all sorts of treasures through successfully obtaining court-ordered forfeitures of property allegedly connected to drug crimes and certain other crimes. The distance Ruark drove from the bar to Ocean City was around thirty miles. Were Ruark just any old anonymous person, his prosecution would be rather unremarkable. Even if his breathalyzer test result accurately reflects his blood alcohol level at the time of driving — breath testing machines obviously can only test for the alcohol level at the time of the test, alcohol levels can increase as time passes (through ongoing absorption of alcohol into the bloodstream), and the tests are ripe for flawed results — the 0.15 blood alcohol result is a commonly seen BAC level for drunk driving cases, and does not automatically translate into significantly impaired driving. Mr. Ruark also is being charged with the misdemeanor of wearing, carrying, or transporting a handgun while under the influence of alcohol, under Md. Pub. Safety Code § 5-314; he had a handgun carrying permit, apparently after having received death threats related to prosecutions, so cannot be prosecuted for mere possession of the handgun. As sometimes happens in Maryland, the court docket has not yet recorded his drunk driving case online, but has recorded his handgun case showing that Mr. Ruark is being defended by Ocean City lawyer Richard Parolski. Unfortunately, even unremarkable prosecutions can have devastating effects on convicted people, starting with the risk of jail, proceeding with suspended driving privileges for drunk driving cases, and going further to collateral risks to one’s immigration status (but not for a drunk driving conviction that does not involve a collision), any security clearance, and any employment by the military (even for run-of-the-mill drunk driving convictions, as Mr. Ruark knows full well, in explaining one of the reasons that his son with military aspirations succeeded in getting his drunk driving case dismissed last December in the same Worcester County where State’s Attorney Ruark is now being prosecuted). Too often when I try to persuade prosecutors to reach dispositions that avoid such devastating collateral consequences, I receive a rote or flip answer that my client only has himself or herself to blame for doing the act that exposed him or her to such collateral risks. Oh, yeah? What if my client is innocent (too many innocent people get convicted) and is facing such risks? Wicomico County Executive Rick Pollitt said: “It’s tragic if a whole career is thrown out the window for a very, very serious lapse in judgment.” Similarly, all criminal defendants should be given the same consideration about the collateral consequences of convictions, by receiving more sensitivity about the situation from prosecutors and by changing the laws that put immigrants (and soldiers in the instance of certain petty crimes including unremarkable drunk driving offenses) at risk for a whole host of convictions. This is also a time to re-think unjustly inflexible get-tough approaches to crime, including Mr. Ruark’s own Project Exile program against handguns, where he himself now is being prosecuted for a handgun offense. ADDENDUM: Thanks to the reader who corrected my previous mis-statement about where Mr. Ruark’s son was prosecuted for drunk driving. The inaccuracy remained online for a few hours, and has been corrected.